Once, someone from the game industry said: "If we weren't writing games as a profession, we would be hating our day jobs and writing them at night". I guess we are those guys. Although it is not an exageration when we state that we are writing games at night, we do like our day jobs and we are professional project managers in the IT sector for quiet some time. The MaslasBros studio idea came to life after the logical assumption that in order to create a computer game you must first obtain the necessary tools. Soon enough the necessity of a place to work with those tools was mandatory. There are currently no trailers available for MaslasBros. Check back later for more or contact us for specific requests! There are far more images available for MaslasBros, but these are the ones we felt would be most useful to you. If you have specific requests, please do contact us! "This is not only a game this is more like a love letter!" "Wing Commander Flat Universe is an increadible top down shooter with increadible graphics." "It's really cool! I like it! I like this a lot. 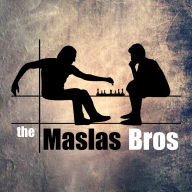 I cannot wait for more things to come out from Maslas Brothers..."
"...I will say that the version, of music, I hear on this game is very well done though. One of the best I have heard so far. Cory's re imagining of the old music is sounding great too..."